Vanilla beans are expensive but they really add rich flavor to this classic cheesecake, which is topped with fresh strawberries. /I> Combine graham-cracker crumbs, sugar, almonds and butter in bowl until crumbs are evenly moistened. Press mixture into bottom of a 9-inch springform pan. Bake until golden brown, 10 minutes. Cool on wire rack. Wrap bottom and side of pan with heavy-duty foil. Set aside. /I> Reduce oven temperature to 325 degrees F. Remove seeds from vanilla bean with tip of small paring knife or spoon; set aside. (Place bean in a canister with granulated or confectioners sugar to make vanilla sugar.) Beat cream cheese in mixer bowl on medium-high speed, 3 minutes. Scrape side of bowl with rubber spatula. Beat in vanilla seeds. Gradually beat in sugar, scraping sides of mixer bowl with rubber spatula. Add eggs, one at a time, beating just until blended and mixture is completely smooth. Stir in sour cream and vanilla extract, if using. Pour filling into prepared pan. Place pan in a larger roasting pan and carefully add enough hot water to come halfway up side of springform pan. Bake 1 hour. Turn off oven. Let cheesecake stand in oven 1 hour. (Do not open door.) Remove from water bath and cool on wire rack 1 hour. 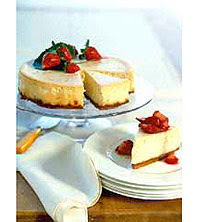 Cover cheesecake and refrigerate 6 hours or overnight. Calories 525, Total Fat 36 g, Saturated Fat 21 g, Cholesterol 170 mg, Sodium 372 mg, Carbohydrate 41 g, Fiber 1 g, Protein 9 g.
This entry was posted on 2:16 AM and is filed under Desserts . You can follow any responses to this entry through the RSS 2.0 feed. You can leave a response, or trackback from your own site.